On turning 15, selected girls are invited to train to become fortune tellers under an ‘urara’. There is strong competition for apprenticeships, but one girl, Chiya, has come in from the mountains with no idea what an urara is or even how to behave around other people. Urara Meirocho is a great example of a show that could work really well for children… if it weren’t packed full of the sexualisation of children. It’s cute, colourful and shows off a whimsical world inspired by Edo Japan with shades of Spirited Away or My Neighbor Totoro – right down to including a catbus! It doesn’t matter how much I like the world a series is crafting though, it is really hard to get over the constant and often non-consensual sexualisation of these girls, who are apparently 15 but look more like 10-year-olds with breasts. Gets a lot less “cute” when she starts enforcing this standard with the girls around her, who are naturally distressed and mortified. And when the novelty starts to wear off this very thin and much-repeated joke, she adds a bit of variety by flipping up her new friend’s skirt – in order to look for a tail. She’s so cute. However, when her friends figure out that her very long hair is actually really soft and smooth, she becomes very uncomfortable with them touching and leaning on her uninvited. Fancy that. In an alternate universe somewhere they have skipped this aspect entirely, and the series is about four very different girls who become friends as apprentices to a fortune teller in a tea shop. They all have different backgrounds, different cultural customs and different expectations from their apprenticeship. Over time they make mistakes, work hard to pass their fortune telling exams and learn which style of fortune telling each of them is most suited to. All of this is present in the text, and on that premise alone I would have been very interested. It could make for a decent supernatural school show, but they aren’t even handling those aspects of the story well. I was most intrigued when they explained that there are different types of fortune telling and they would eventually choose which to specialise in – only for three of the four to reveal they had already chosen their specialism. What’s the point of a hook if you’re just going to dilute it? We also need to talk about the presence of yuri undertones – and overtones. Chiya and the other girls, Chiya and the tea shop owner, their interactions are dressed up as yuri for titillation purposes only. Then, at the end of the episode, we find out that the short-haired and gallant police captain has two subordinates with a massive crush on her, played for comedy purposes. It’s very unlikely this will be treated seriously, and it will almost definitely be mined for the male gaze. 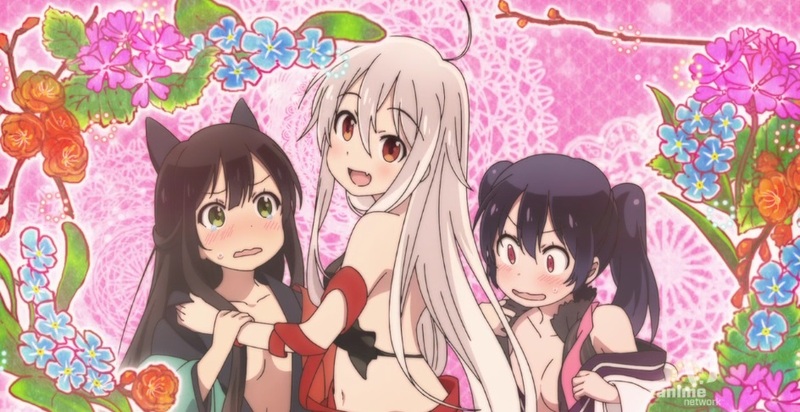 Ultimately, the tummy-baring and yuri-tinged interactions are presented as the main draw of Urara Meirocho, which makes it a hard pass from me. If you’re reading this site then chances are no amount of pretty aesthetics or a decent premise at heart can offset regular child-underboob.